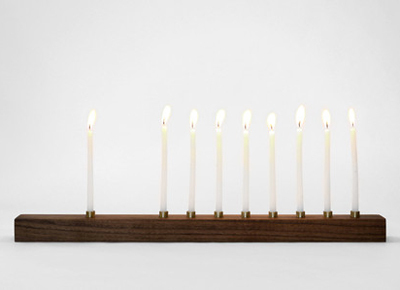 NEXT ARTICLEThe World's Prettiest Menorah? Listen up, people: Your softest, silkiest sheets are not just a matter of thread count. They're a matter of cotton quality. Look for 100 percent pure organic or Egyptian cotton for your absolute coziest linens. Bonus tip: Here's how to wrangle your fitted sheets into neat little packages. Wanna know what's not cozy? Chilly bare feet sticking off the end of the bed. To make your bedding a cocoon of warmth, tuck the top sheet and your base blanket in on both sides of the bed as well as at the foot. Watch our video to see how the pros do it. To achieve the ultimate comfy bed look and feel, a fluffy down comforter is an absolute must. It's like wrapping yourself in marshmallow fluff. P.S. What's a comforter without its cover? Watch our video for the easiest way to stuff a duvet. There's a fine line between a perfect bed and one that looks, well, sterile. After all, you want your bed to say "Hop in!" not "Don't touch." The easiest way to avoid the latter? Leave one detail slightly mussed or rumpled. An artfully tossed throw, for example, just begs to be curled up in. Speaking of throws, what could possibly be cozier than a bed-sized sweater? Put one of the luxurious, massive wool knits currently breaking Pinterest on your wish list. You heard our spiel about cool weather outfit layering. Same rules apply here (layers add visual and physical warmth). Our favorite blanket-layering combo is a top sheet followed by a light blanket, a big ole' comforter and throw to finish. Mass amounts of pillows are key ingredients for a mega-cozy bed. So why, pray tell, would you toss a few lumpy standard pillows on the mattress and call it a day? Check out the adjacent picture to familiarize yourself with some different types. ...And Load Up On 'Em! The more pillows the merrier, people. For a look that's lush while still refined, try layering back to front. First, place two pillows in pillowcases, followed by two euro shams and finally two front-facing pillows. Accent with a lumbar or bolster pillow for extra flourish. Mattress covers didn't sound particularly exciting until we discovered that they come in thick, fluffy goose down and even über-cuddly shearling...and then experienced the total bliss that came with adding them to our bed. Social calendar be damned: When it's cold outside and we're dog-tired, nothing holds a candle to crawling into the little slice of heaven that is our bed. So for the love of all things comfy-cozy, we've commited to creating our snuggliest, dreamiest bed ever. Here, ten genius tips to make your own.